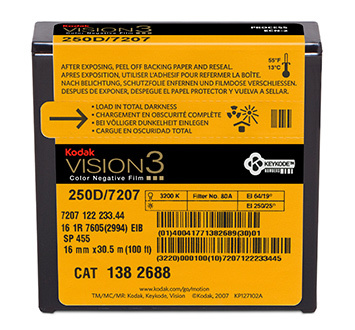 KODAK VISION3 250D Color Negative Film 5207/7207 is a medium-speed, incorporates the attributes of the VISION3 technology into a medium-speed, daylight-balanced emulsion. VISION3 250D Film has outstanding skin tones and color reproduction, while adding technical innovations that improve product performance and increase product versatility. The proprietary, advanced Dye Layering Technology (DLT) provides noticeably reduced grain in shadows, allowing you to pull out an amazing amount of shadow detail. The proprietary Sub-Micron Technology enables 2 stops of extended highlight latitude, so you can follow the action into bright light-in a single shot-without worrying about blown-out details. 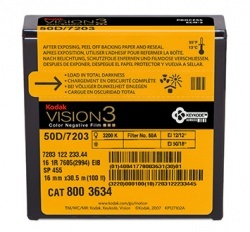 VISION3 250D Film is designed to extend the capabilities of the DI (digital intermediate) process. The improved grain provides better to signal to noise capabilities allowing the colorist to provide greater detail in shadows, while the extended highlight latitude enables improved digital "dodging and burning" to provide more details in highlights. Use these indexes with incident- or reflected-light exposure meters and cameras marked for ISO or ASA speeds or exposure indexes. These indexes apply for meter readings of average subjects made from the camera position or for readings made from a gray card of 18-percent reflectance held close to and in front of the subject. For unusually light- or dark-colored subjects, decrease or increase the exposure indicated by the meter accordingly.